When are expectations in life unfair? Society runs on expectations for the most part. Human beings are expected to treat others as we’d like to be treated, to keep our word and to show up on time. Husbands and wives are expected to be faithful to one another, employees are expected to work hard and bosses are expected to pay fairly for that work. Drivers are expected to remain on the street when in motion, not rumbling along the sidewalk, and in turn pedestrians are expected to remain on the sidewalk not jump into the middle of moving traffic on the street. When one of any of the aforementioned expectations aren’t met things tend to go awry. But what of expectations of another kind, not universal expectations that apply to society as a whole but rather expectations for specific individuals? What about those upon whom expectations are placed without their consent? When does somebody else’s expectations for you interfere with deciding for yourself what you’d like to do? Maybe in life the only thing anybody has the right to actually expect is that every Sunday will come before Monday. Outside of that I suppose life’s just a crap-shoot and you take what you can get. As if you couldn’t tell from the introduction to this review of Jimmy “Baby Face” Lewis’s first release in many a month, what he has to offer us is not quite what was expected out of him. But of course this isn’t fair to Lewis. Not at all. Why would we even have reasonable expectations for an 18 year old kid who, if he was like most 18 year old kids throughout eternity, probably wasn’t sure when the sun rose if he wanted to stay in bed all morning, go to the beach and flirt with girls all day or hop in the car with his buddies for a road trip. Such is the teenage mind – and that’s not a bad thing whatsoever in case you’re wondering. The difference is of course that unlike most teenagers Lewis was a professional musician and with that comes expectations, no matter your age. He was in the midst of a budding career as a rock ‘n’ roller, something he’d been pursuing professionally since he was 16 years old when he first got noticed for his dynamic guitar playing. Considering that at the time rock ‘n’ roll was in its infancy (in fact when he first was heard from on record in June of ’47 it was still in its pre-natal stage) how can he be expected to have already settled definitively only what style of music overall he would pursue, let alone what avenue in a still largely unformed genre like rock he’d head down? Yet because those early sides had shown him to be such a gifted guitarist, something that stood out in ANY type of music at a time when that instrument still took a back seat to… well to be honest, virtually everything short of a bassoon… and since the sound he drew from those six strings perfectly encapsulated the very thing – excitement – which also stood rock apart from the rest of the musical kingdom, it stands to reason that he’d seek to define that approach before the field got too crowded. After all, it wasn’t as if record companies would somehow overlook his talents on the guitar when signing him, would they? But then again we’re always preaching the value of branching out, of not being confined to just one stylistic pursuit, and since he was of the age when confidence borders on cockiness in even the most mild of individuals anyway, who’s to say that he wasn’t equally sure that he could impress in other ways? Maybe the fault isn’t his at all, but rather ours in the present, decades after all of these records came and went, when our impressions of Lewis have been shaped more by what followed this – something which of course in September 1949 would not have been the case. Maybe back then when Every Sunday Before Monday came out – if we even remembered the name Jimmy Lewis – we’d have gone in with far different expectations based on what the limited output he’d delivered so far… or even no expectations at all. If you DID have expectations though, even if not centered on anything to do with Lewis himself, the opening to this was sure to throw you off completely, as Baby Face’s guitar sounds primitively delicate, something hearkening back perhaps to country blues techniques or a jazz-trio sort of feel. In other words if you thought a rock ‘n’ roller was bound to come out of the gate rocking, you’d be sorely disappointed by this. Disappointed, yeah, but maybe a little intrigued by what he’s laying down all the same. Lewis certainly isn’t alone here, which removes him pretty quickly from the more sparse sounding country blues idiom, as the other pieces to the arrangement fall into place in short order. We have some incidental percussion and then some faint droning horns setting a bottom for the others to play off. When Jimmy’s voice comes into sight he’s joined by a smattering of piano and then more horns playing an entirely different line than the others who maintain their more rudimentary function. Of course it’s still something of a fragile sound even when all of the components are present but it has taken on a different aura already, one that does pull it back into the rock orbit, albeit in the more tenuous ground of balladry that is always at risk for going too far in a pop direction or into the hazy middle ground between jazz, blues and rock. I suppose the latter is the case here as this never really grabs you by the scruff of your neck and gives you a good shaking. If you looked at the label you shouldn’t be all that surprised, for the band is led by Tab Smith, a much respected name but one from a different musical background than what Lewis was best suited for. Not surprisingly the horn responses to Lewis’s lines are more whimsical than energetic and the sax solo by old friend Hal Singer, while maintaining a much appreciated deeper tone – one which features a nice distant sounding counterpoint on trumpet of all things – is pretty mellow all things considered. We wait for Lewis to unleash his vibrant guitar – or at least those of us aware of his abilities on the axe do – but it never comes. You hear a few strums underneath a line and at the end he gives us a few more of those, but they’re inconsequential and outside of the intro where it was the primary instrument if this were anybody BUT Jimmy “Baby Face” Lewis the guitar wouldn’t even be mentioned. So surely that must mean that the record is a failure, a missed opportunity and a sign that Jimmy Lewis was wavering in his commitment to being an all-out rocker, right? Well, not exactly. Again it comes back to the unavoidable role expectations play in all of this, whether we want them to or not. Being the second single culled from the Tab Smith led sessions we’re aware of the stylistic conflict inherent in that pairing, but we also know that Lewis had fought against that last time around and managed to come out a winner thanks to his guitar prowess. Here he doesn’t even break that out of his bag of tricks and so he’s going to take a drubbing instrumentally if he lets Smith and company dictate the terms of his record. True enough, but Lewis does something here that most headstrong 18 year olds never would consent to do… he adapts and goes with the flow. On Every Sunday Before Monday Baby Face Lewis follows the game plan as it was laid out to him but he pushes back against it in subtle ways with his vocal technique. He wrote the song but it’s doubtful he wrote the arrangement, not when someone with Smith’s résumé was in the room, and I’m sure they figured since they’d already let Lewis have too much sway in how things went on other tracks where his guitar got the spotlight, on this song they were determined to put their foot down and require him to adhere to a certain decorum. That shapes up to be a losing proposition for someone as rambunctious as Lewis, but rather than fight them in a battle of wills where the song – and the listener – will suffer when it all falls apart as a result of their outright clashing, he gets his point across throughout this by how he delivers the lines vocally. Though he’s sticking with a more accepted approach for the most part, his tone perfectly measured and in control, every so often he manages to strain at the seams as he increases the intensity on certain lines which makes the song come alive in ways their modest playing behind him won’t consent to and the difference is striking. What they represent of course is the past, or at least the take-it-slow approach of those whose positions in life are rather secure and thus they see no need to rock the boat. There’s nothing to be gained by that, they reason. Their homes have mortgages that are only half-paid off by this point, their social standing is secure and having to explain their outlandish behavior if they follow this crazy kid down some dark alley of musical tumult isn’t going to help them be invited to next week’s bridge game with the Hendersons down the street. So they preach toning things down, keeping in the slow lane, or at the very least maintaining a safe comfortable pace. After all, they reason, it worked for them. Ahh, but times have changed and yesterday’s pace with smaller engines and rockier roads to travel have been replaced by V-8 engines and smooth four lane highways suitable for this modern age and someone like Lewis is going to be itching to get on the open road and step on the gas and see how fast he can go and just where that road will take him. He doesn’t get to do so in THIS automobile. The others along for the ride are carrying too much weight and who knows if they might slug him over the head with a horn and toss him in the trunk if he tries to stomp the gas pedal too hard, so instead of letting it rip he just subtly speeds up coming out of the turns and hopes they won’t notice or complain too much. It works well enough in that regard, the song – about the downbeat nature of heading into the work week after a rousing weekend ends – fits this slower approach pretty well. Lewis’s stop-time harangue about how his “glamour girl” goes behind his back to “borrow” the money he put away so she can have fun while he’s out trying to pay the bills during the week, is the most effective vocal turn he’s allowed to get away with, but just like the character he portrays in the song Lewis is already eyeing next weekend and how he’s going to live it up himself. That’s the lesson learned here, rather than accept the workmanlike mindset that keeps you from ever fully enjoying life, Lewis, his girl and surely his fingers which are itching to rip off some incendiary playing on the guitar, are bristling against that notion. While he doesn’t get to fully express those views on Every Sunday Before Monday, that only shows how entrenched those old standard approaches were, both in music and society as a whole. The road to this promised land was still clogged up with the old guard slowing things down and so teenagers like Jimmy “Baby Face” Lewis would need to take the reins of rock ‘n’ roll from adults, forcibly if need be, if they were ever going to be allowed to open things up completely. That we in the present looking back have such high expectations for those artists early on like Lewis who’ve shown a willingness to push the limits before tells you that ultimately their efforts were successful. If they’d been forced to conform and keep their brash attitudes under wraps forever rock would’ve died out long ago before any of us were around to enjoy it. 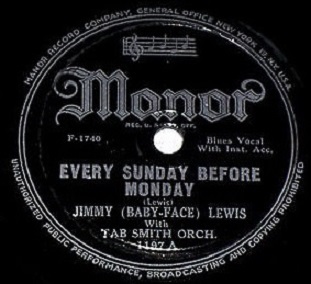 Leave a reply on "Jimmy “Baby Face” Lewis: “Every Sunday Before Monday”"